Have a go at something a bit different .. 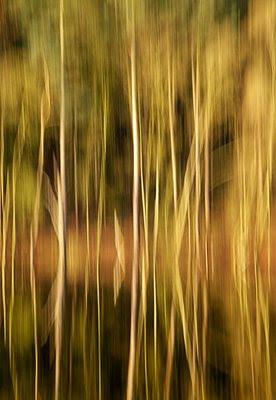 Instead of shooting pin sharp images with a great amount of detail in them why not have a go at shooting a more abstract composition. 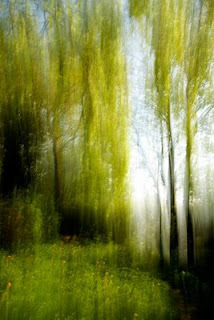 Abstracts can be as abstract as want them to be , some are simply patterns where the image source is unrecognizable, others allow just enough of the image source into the abstract image for the viewer to have an idea of what the abstract represents. 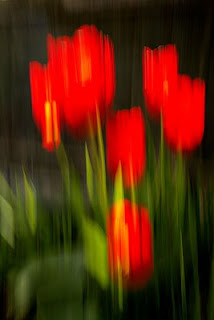 Abstracts can often be quiet dramatic take these red tulips that would have looked quiet bland as a straight forward capture. With digital photography if is now quiet easy to produce such images the technique I have used for the examples here is in portrait perspective because I find this works best for this particular technique and upright subjects. The camera can be either tripod mounted or hand held. I find tripod better providing you can loosen the head enough to allow easy movement for an up and down motion. You will need to set your camera to shutter priority at around 1/15 sec this may give you a aperture of F22 on a sunny day if it does great this will be useful. Manually focus on your subject and also switch of autofocus and image stabilization if you have it. Move your camera so it is pointing upwards with your subject at the very bottom of the frame then as you release the shutter let the camera drop down until it is about the same distance below the subject. If you have digital check your result on the back of your camera. Try this a few more times in this direction and them have a go from bottom to top as this produces a different result. You can obviously also shoot landscape perspective and panning from left to right or visa versa is good for this as is using a zoom lens to zoom in and out in stead of panning. There is so much you can do with this so have fun. Sunny Day at Pott Shrigley ..